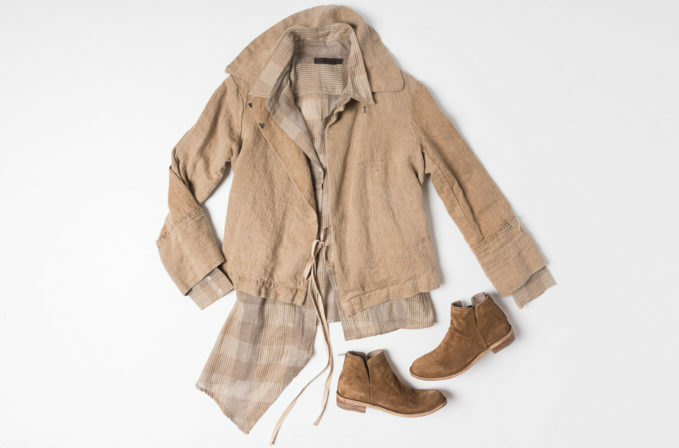 Casual rustic in tones of the desert is the vibe of the new Nicholas K. A subtle flannel in a sand has an asymmetrical drop hem that can be tied with drape and different form. Greg Lauren clothing often is created from reworked vintage fabrics into unique and handmade garments in his artistic vision. The Greg Lauren tan jacket layers well over the Nicholas K tan flannel shirt. The warm, desert sand toned outfit works with a pair of Officine Creative brown suede ankle boots.